Fully integrated website development, support, cloud hosting and content management for this major Adventure Tour Operator. We have worked closely with Explore for a number of years on a number of projects from working with 3rd party development companies to building bespoke applications. Explore operate nearly 600 tours worldwide, and sell worldwide, so their website needed to be incredibly flexible in order for them to be able to present these tours to their clients, and sell them effectively. Due to internal reasons, our original website have been replaced, however we continue to have an ongoing relationship with them and their team as the company is very close to our hearts. "I felt it only fitting to praise when praise is due - and this is one of those times." Images are managed in our TravelZen image component, which in the case of Explore is integrated with their Image Library system back at HQ. All their marketing team need to do is tag the images correctly in their image library and send it off to the website and the system deals with the rest. In addition to this, they are able to pick focal points of the images so that if the image is cropped by the system, we can make sure no one has their head chopped off! Content management of the website and static pages is handled by third party open source extensions, while the travel related information is handled by our TravelZen Content Management extension. In the case of Explore, they are using the tour component, along with the accommodation, locations and other useful functionality. Explore's search is powered by a SOLR indexing system which allows users to be able to make incredibly complex queries in a fraction of a second. This allows us to create the extremely effective search facility on Explore's website. SEO is core to our developments, since taking on the TravelZen system and its associated structure and functionality, Explore’s natural search engine traffic has rocketed, by ensuring that every tour and every landing page has just the right level of SEO. 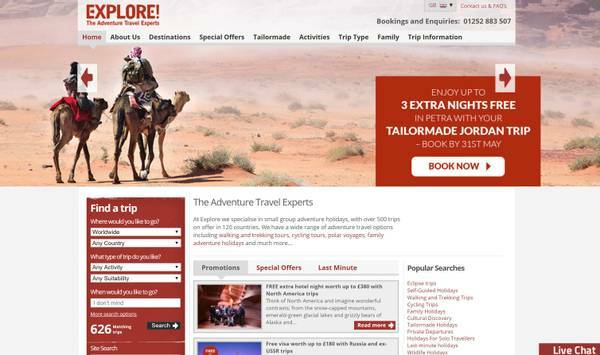 As Explore operates worldwide, it is important that their website reflects the local markets, both in terms of currency, but also tone of voice and in some cases features. Managing multiple sites however is a huge task which is not efficient. Explore manage one site as the default, and any changes to the different locales are handled as overrides so that they can be managed independently.